Vijay Mallya has his problems: He owes $1.3 billion, his passport has been revoked and India wants Britain to deport the self-styled "King of Good Times." The Indian tycoon's fall from grace has become a media obsession in his home country: How did the beer baron -- a man with his own F1 team, cricket franchise and premium airline -- become a poster child for unpaid debts? Mallya's bad loans are just the tip of the iceberg. More than 5% of India's bank loans are classed as non-performing, meaning they have gone sour. When debts that have been restructured or written off are included, that figure jumps to more than 14%. A booming economy has helped paper over losses, but India's ratio of bad loans now far exceeds that of China by some measures. "The [bad loans] of Indian banks have risen to alarming levels, as reforms have stalled, projects are moving at a snail's pace, external demand has contracted sharply and domestic demand remains anemic," analysts at Societe Generale said earlier this year. Indian officials, led by Reserve Bank of India Governor Raghuram Rajan, are trying to get a grip on the problem. The central bank has audited lenders and forced them to clean up their books. "You can put lipstick on a pig, but it doesn't become a princess," Rajan has warned bankers. "So dressing up a loan and showing it as restructured, and not provisioning for it when it stops paying, is an issue." Investors have punished the country's banks -- many of them government-owned -- for their lack of discipline. Shares in the State Bank of India have lost a third of their value over the past year. Punjab National Bank has declined 45% over the same period. Against this backdrop, 17 banks have been trying to claw back money lent to Mallya's defunct Kingfisher Airlines. 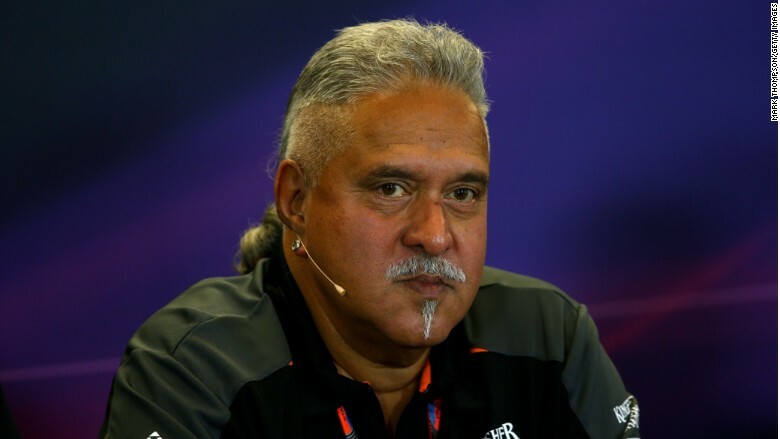 Mallya, who is often described as India's Richard Branson, left India for the U.K. just before creditors asked the Supreme Court to make sure he stayed in the country. The businessman says his offers to repay a portion of the money owed to the banks have been rebuffed. "As professional bankers, they would like to settle and move on but, because of my image as portrayed, they are reluctant to be seen as giving me any discount," he told the Financial Times in an interview published Friday. "It will attract huge media criticism and inquiries by vigilance agencies in India." His case has become a major political issue in India. "As far as the government is concerned, the clear instructions are that the banks must go all out to take every possible action," Finance Minister Arun Jaitley told parliament last month. In the meantime, Mallya's troubles are serving as a powerful warning about the dangers of borrowing too much. "Debt is very much like a dynamite," Rajan cautioned in December. "It's an instrument which is very useful in right places, and explosive in others."